Through class discussion and our readings in Crawford’s America’s Musical Life, it’s well established that rhythm and percussive sounds were important elements of African-American and slave music. However, its well documented that slaves were banned from making drums and other percussive instruments. Although banjos and fiddles were common examples of instruments mentioned in the text, I was curious to know about less common ones that were created and used as well. Folk musical instruments including homemade horns, captured sometime between 1934 and 1950, Lomax Collection. 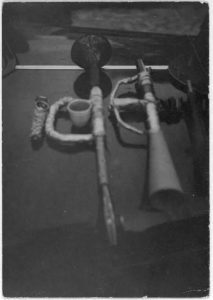 Looking through the Lomax Collection of the Library of Congress, I came across several images of homemade instruments. They appear, and this is only my best guess from analyzing the image, to be crude trumpets. Unlike the rhythmic instruments described in the Crawford, the significance and history with slave music of these instruments is less obvious to me, so I searched for instruments that have a more solid history with the African culture of the slaves. From this idea, I was able to find the Afro-American Folk Music from Tate and Panola Counties, Mississippi, edited by David Evans. This was a wonderful resource providing many musical examples for each topic it covered, and it also covered many different kinds of instruments. The one I would like to talk about is the Quill. Quills, a type of pan flute, Tom Leonardi. 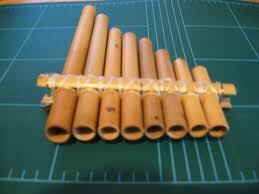 The quill is a pan pipe instrument made from bamboo rods. This instrument is not unique to American culture alone, many variations are found in history all over the world. Specific to the slaves, the quill was a common instrument found in southern Africa today, and when slaves were brought to America, the instrument came along (Leonardi, The Quills…). However, what caught my interest was they way it was described being played in the aforementioned article by Evans. “The Devil’s Dream” was performed by Sid Hemphill, and recorded by Alan Lomax. The quill used as a 10-note quill, but only the four lower notes were played. The scale of the quill is described as “an unusual hexatonic scale lacking the fourth and the fifth.” The reason being that the octave was stretched by a semitone, roughly, according to Evans. Along side the four notes that were used in the piece, whooping produced the remainder of the sounds. It is this technique that primarily ties the pan flutes to African traditions, where it was common to alternate between blowing and whooping notes. Taken from the text of “Afro-American Folk Music…” Image depicts an approximation of the whooped and blown notes of the Quill. Sadly, today the quill has phased out of use in the United States and replaced by the harmonica, which was due to it being more flexible in sound production and inexpensive to purchase. However, the technique of whooping is still used on the harmonica today in many forms of folk music. To connect this with our class readings, our class has discussed how rhythm has been important in aiding and defining slave and African-American music. This has primarily been due to our focus of spirituals, work songs, and other folk songs of the 19th center that all include text, we have not talked about purely instrumental music or instrumental sections of songs to any length. By looking at quills, I have not only found other musical resources of folk music that are not focused purely on text, but have found another source that emphasizes the importance of rhythm and percussive sounds. The whooping, due to the change in tone, sounds more percussive. Additionally, it was rare for much more than drums to be played with a quill, showing who folk music used percussive accompaniment with other instruments instead of harmonica or melodic accompaniment. While I can’t verify that the following recording is the one talked about in the Afro-American Folk Music archive, I believe it to representative of the quills sound. Recording of Sid Hemphill and of the quill. “Sid Hemphill – Old Devil’s Dream”. YouTube. November 30, 2010. Accessed October 02, 2017. https://www.youtube.com/watch?v=SRVVza3ObfM.